Many customers come to us at Savvy Apps with a set of unknowns and unclear path to obtaining their goals. Through the years, we've honed our discovery process to solve this problem. We start by casting a wide net, gathering as much information as possible, and then whittle that information down into actionable takeaways. In this article, we've outlined why this process, which we like to call a “discovery kickstart,” is critical for your app. We run through the three stages of this process and how each stage is structured to set your app up for success. Why Does Your App Need “Discovery” Anyway? and determined what will create real value for users. The length of our discovery process varies from app to app. In the case of Savvy Apps, it also depends greatly on the customer's specific needs and their starting point. Generally though, we use this process with those who need to develop feature ideas to those who have too many feature ideas to begin with. A visualization of the three stages that make up the discovery process. No matter how long it takes, the discovery process is broken down into three key stages: research, ideation, and evaluation. The research stage is dedicated to conducting background analysis through questionnaires and surveys. Ideation is where a lot of brainstorming and feature ranking takes place. Evaluation is the culmination of the discovery process and involves sketching and concept testing based on the ideas that have come to light earlier in the process. Keep reading as we break down each step of the discovery process and explain why it's important for your app. The research stage of the discovery process involves transferring existing knowledge to all members of your team. During this stage you analyze any relevant background materials you currently have like competitive analysis, market research, and related metrics. Analyzing these background materials may give you some initial direction. Then you want to dive deeper by conducting questionnaires and surveys. These techniques provide a means to extract some of the existing knowledge that may not have been shared initially. The questionnaire helps aggregate relevant background information, documents, and conversations into a unified format. Using an interactive survey tool like Formstack, we pose a number of thoughtful questions to our customers to draw out the specifics of their app vision. This insight directs our design decisions down the road. Our questions and prompts range from the more obvious to the more creative. Describe the problem which your app solves. What is the one thing we must get right to make this app worth using? Comparing your brand to an automobile, what would you be and why? When people use your app, how do you want them to feel? What do you want them to know about you? And most importantly, what story do you want to tell? These questions are meant to encourage the app creator to think not just about the purpose and value of their app, but how they visualize their app's brand and what they want users to feel when using the app. Buyer Legends go a level deeper than a typical user persona by gathering insights into how your app can best engage each target audience to reach your goals. Having a shared understanding of how each audience thinks will help us identify problems and design their solutions before they actually become problems. Like the questionnaire, we use a survey tool like Formstack to extract the information we need for the buyer legends. We then create visuals in Sketch based on those survey responses. Pick up a copy of the book to learn more about buyer legends. We compile survey answers to create buyer legends of target app users. These legends outline user and organization goals and what might stand in the way of achieving them. The ideation part of the discovery process consists of creating new ideas, expanding on them, and trying to create a path forward with the ideas that bubble to the top. We use brainstorming and card sorting sessions to unearth as many ideas as possible and organize them into an actionable plan. The objective of the brainstorming session is to generate as many ideas as possible and record them. You can start brainstorming by identifying a single focus question. For example, a good focus question for your app brainstorming session may be “What features do our users need?” We've done this in person and by gathering every member of the app team on a video conferencing tool like Google Hangouts. Using actual sticky notes or virtual sticky notes through a tool like Mural, we prompt the participants to write down all of their ideas for the app. After all the notes are completed, we group similar notes together so that clusters begin to form. Using a second color of sticky notes, we assign a name to each group. To get the most out of your brainstorming sessions, try conducting the sessions in silence, saving the conversations for later. This allows everyone to get their ideas down and have their voices heard. Another best practice is to allow duplicates and similar notes. When we've done this in the past, we've found that inevitably some of the ideas ended up being similar to others. It's better to get all ideas down than to waste time making sure each idea is wholly unique. Not only can you sort those similar ideas into groups later, you might also get a slightly different idea or perspective from each similar note. Need help with your app's discovery process? Let us kickstart it for you. Card sorting is a technique used across disciplines to identify, categorize, and prioritize ideas. We use it specifically to prioritize the features of an app so that they align with both our users' mental models as well as the creators' business or organizational goals. Card sorting can be done in person with actual card stock or virtually. Check out this guide for an in-depth look at the card sorting technique. This activity is important because it gives you an idea of how people rank things in their minds. We can make assumptions with navigation and hierarchy, but the user may not mentally see it that way. Card sorting closes that gap. If a stakeholder of the app comes in later in the process, for example an investor or a vice president, and they are not familiar with the app, the card sorting results make it easier to explain why you made certain decisions. We prefer to split this into two tasks: an “internal” card sort and an “external” card sort. In our internal sorts, the participants are those who have some sort of familiarity with what the app will be. The internal card sort helps us rank the features by importance, surfacing a proposed feature prioritization. This is broken down into three categories: very important, somewhat important, not important at all. After narrowing our list of features based on the internal card sort results, an external card sort is conducted. This is similar to the internal version except the external sort is focused on people who have no knowledge of what the app is about. Conducting two separate card sorts (internal vs. external) allows us to see if there are any discrepancies or differences between the app creators’ ranking results and the users’ ranking results. Sometimes what may seem very important to the creators doesn’t rank as high as what actual users feel is important to them. It’s important to make sure the views of the creators are not clouding or overshadowing the needs of the users (see “founder blindness” at How to Ensure Your App Will be a Huge Failure). There needs to be a balance. We can build something that the creators feel will be useful to their target audience but if users doesn't feel that way, the app likely will not succeed. It's important to make sure the views of the creators are not clouding or overshadowing the needs of the users. To set your card sort up for success, try to limit the number of cards whenever possible. It can be overwhelming for participants when you have a lot of cards to sort through. In a recent card sorting exercise, we narrowed our external card sort down to 11 items from the original 17 that we used in the internal card sort. Some people go as high as 35, but our opinion is that is really pushing it. It's also a good idea to let the participants know an estimate of how long the activity will take. At the beginning of the card sort we display a message saying, "This activity should take about 10 to 15 minutes." In the past, we've drawn external card sort participants from UserTesting. We also have used Optimal Workshop and FormStack to facilitate the card sorts. If you don't have the revenue to enlist help from recruiter sites like UserTesting, try tapping your network and any resources you may have to look for participants. For example, if you were testing a product related to college admissions, you could reach out to a contact at one of the colleges nearby and get names and contact info for people that worked in the admissions offices. If you don't necessarily need a specific demographic for your participants, you could use a guerrilla testing approach like finding strangers in coffee shops or reaching out to your friends. Also keep in mind that if you have access to a user base from another related app, you could recruit from there as well. This last stage of the discovery process is dedicated to sketching out and examining concepts based on the features that surfaced in the research and ideation stages. We then conduct concept testing sessions to run the sketches by members of the app team to get their feedback. We import our screen sketches into Marvel to help participants envision what the screens look like within a device. The goal of concept testing is to show, in general, what features the app would provide to get a sense of whether they meet the needs of the target audience. Concept testing looks at three different aspects of a sketch: first impressions, navigation expectations, and overall satisfaction. We start with impression testing. This involves prompting the participant to jot down a list of tasks users might be trying to accomplish when using the app. After setting aside their list, we conduct a quick test where the first concept is shown for five seconds before it's closed. After the concept is closed, the participant is asked what they remember about the concept, what stood out, and what types of tasks could be accomplished. Testing the participant's first impressions helps us determine what users are retaining in those five-second glances, and if our calls to action are clear. Then we move on to a discussion about the concept’s navigation. We prefer to have the sketch visible to the participant to help facilitate the conversation. We open up the discussion by asking the participant to start at the top of the sketch and work their way down, describing where they expect each button to go and what exactly they expect to see upon tap. After they’ve walked us through each interaction, we have them refer back to their list of tasks they created at the beginning of the session. The participant is asked to describe how they would accomplish each of the tasks based on the current concept. The final step is an attempt to measure the participant’s overall satisfaction with the concept. We display a list of 150 words with a mix of both positive and negative adjectives. We then ask the participant to choose five to six words that best represent their personal feelings about the concept. These steps are repeated for each of the concepts, and each of the participants. After all testing sessions have been completed, we analyze the chosen words across the participants and calculate the number of times each word was selected. There is usually overlap between participants’ words, and this helps determine if one particular concept stands out. Based on our experience we've learned that it's best to keep concept testing to one-on-one sessions and limit the test to only two concepts. Adding more participants and concepts to a session can make the session overwhelming for participants. We also prefer to keep this part of the process in-house as it's difficult for external participants who don't have much knowledge of the app to give the type of feedback we need. 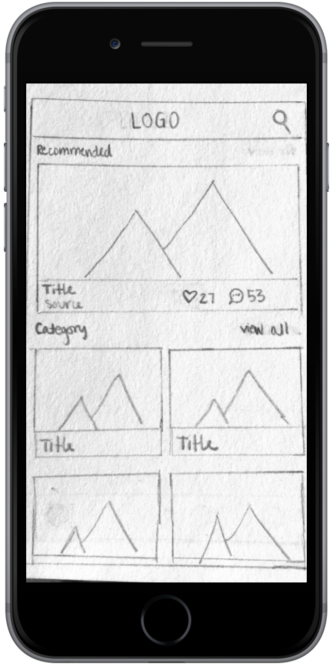 Once we have a more concrete direction, we will focus testing high-fidelity visual designs with participants outside the app team. Stepping through the research, ideation, and evaluation parts of the discovery process is critical for the success of your app. This process enables you to identify what about your app will create real value for your users. It also will guide you through the establishment of your app's feature set that will match your own and your users' goals. Done right, a discovery process will help you avoid costly missteps when moving into development.